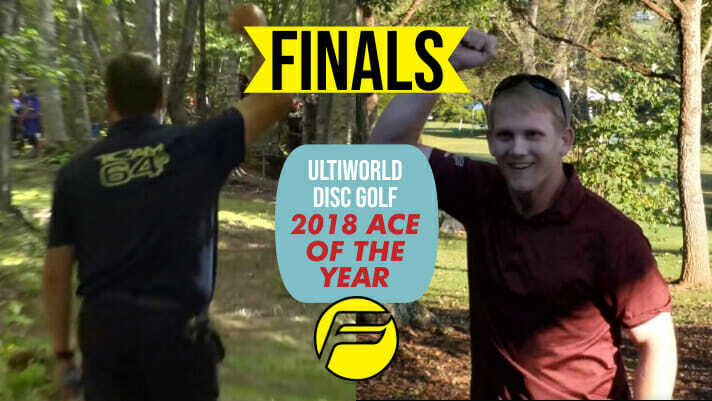 Ultiworld Disc Golf’s 2018 Ace of the Year voting is presented by Friction Gloves; all opinions are those of the author. Check out our review of Friction’s DG Gloves here. It all comes down to this. Two competitors have survived three grueling rounds of voting to earn their place in the finals. Time to cast that ballot for the best ace of the 2018 pro season. Chandler Fry unseated the top seed in round one and has marched through to the final pairing. His Canadian Championship ace helped him to a second place finish, and he’s hoping to do better in this competition. A.J. Carey showed us how to start a USDGC with his skip ace on hole 1. Playing on the second card of the day, he had to do this right after Ken Climo threw a ceremonial tee shot. Comments on "2018 Ace Of The Year – Finals"